Spring hits and the time disappears. Everything goes into the ground, and grows from there. It seems it grows faster than we can keep up with.. But still we push on through the solstice and towards the fall. We were lucky to stop and enjoy midsummer by making and eating pizza fresh from the fire of a cob oven at our friends Solara and Tayler's. They have a permaculture design/ implementation business called Hatchet & Seed based out of North Saanich, BC and do many wonderful things aside from hosting pizza parties. It was also great to finally meet Ann and Gord Baird of Ecosense. I have heard about them and their efforts towards sustainable living, and natural building for years, so it was nice to finally connect. The community of natural building, and permaculture is one of the most inspiring, and refreshing things. Earlier this year we were lucky to be a part of a series on Natural Building called 'Groundwork' put out by a production company based out of Victoria called The Number along with some funding by Telus. The series was recently released, and highlights various natural building techniques including Straw bale, Cob, Timber Framing, and Rammed Earth, as well as many wonderful natural builders throughout BC. In partnership with Pacific Ecoscapes, and the Westmont Montessori school! In the workshop you will gain skills, connections, understanding and the capability to take on your own natural building projects. We will cover both the theory and the practical application of cob, light clay, straw bale, dry stack stone work, roundwood timber framing, living roofs, and more! 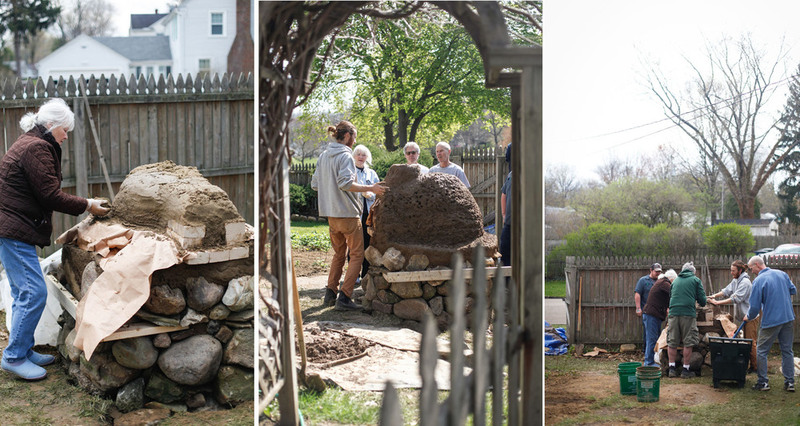 Bring your creativity, curiosity, and questions as we sculpt a one of a kind structure from the ground up! We are also happy to offer couples, students, and seniors discounts! Nourishing space is about as comforting as food that nourishes. I had the pleasure of helping hone the space of Nourish Kitchen and Cafe's new home in James Bay, Victoria, BC. After spending a lot of time at Nourish's first location in Saanich (Also, well worth visiting) nestled into the Gardens of the Horticultural Center of The Pacific, I was very excited at the opportunity to help them shape their new space a little closer to home. With bone broth, benny's, endless ferments, elixirs, local meat and produce, and now dinners, there was a lot to inspire creativity, and motivate me in all that I made, and helped make there. The top of the list for me was crafting a table, that sits in the center of the dining room in front of a beautiful fireplace. I had come upon some beautiful cottonwood slabs shortly before I ended up at Nourish, and it seemed they were meant to belong there. The light colour of the wood, and the soft greys and reds fit right in. I kept the live edge, and the thickness of the slabs, so as not to lose any of the innate beauty of the wood. From that same tree came a few other slabs that then became a mantel, and light feature for the parlour/ private dining room on the upper floor to help tie the separate spaces together. Kelly and her friend, Marla, also had a hand in adding beauty to the space with pressed botanicals. Everyone involved with Nourish can't help but seem to be affected by being just that. Nourished. The space transformed, became something really beautiful. I built high bar tables for couples, trimmed the fireplace with rustic steel (bathed in the ocean tide to help the patina along), and the comfort seeped in. Autumn is approaching, and it seams we're still catching up from the Spring. The seasons are weaving themselves together, the harvest came early, the respite is coming late, and so it only seams fit to post something from the past. This Spring we had the pleasure of weaving a wattle wall for a friend using alder saplings, and cuttings from willow, and dogwood. We respectfully harvested crowded alder saplings, and limited our pruning on every plant so as to not take too much from an individual. Saplings and young branches are quite pliable in the spring, and lessen more and more towards winter. Although some species remain workable year round. 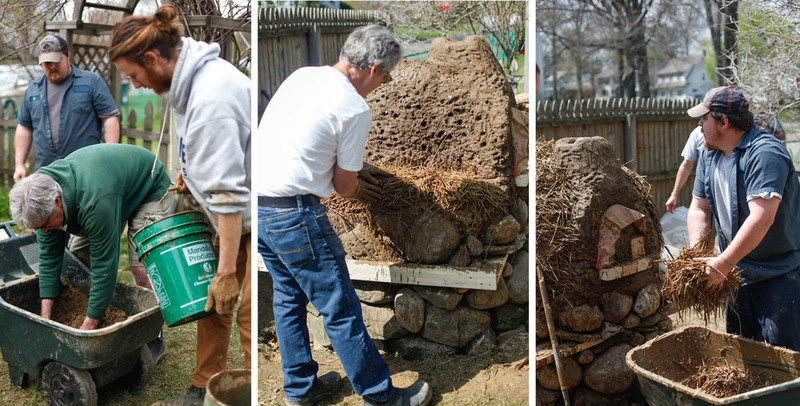 Creating a wattle wall is a great intro to basketry, and other more complex forms of weaving, as well as wattle and daub which is a natural building technique used to create quick, thin, earthen walls, whereby you apply cob to a wattle wall form, pressing it into all the space between, and surrounding the wattle. The light and air that filters through a wattle wall or fence, is particularly pleasing. Wattle also makes great garden boundaries and features, and integrates well with climbing plants. So, as autumn and winter approach, spring is surely just around the bend, and I strongly encourage you to try to weave some wattle into your next years plans. When the earth get's blackened, and charred, and most life is turned to ash, there lies the Morel in the wait. Feeding on change, and taking advantage of the lack of competition, these beauties spring from the earth along with the cycle of rebirth in the burnt forest. I had the opportunity to harvest and dry many morels recently, and spent some time trekking through the deep dark woods with friends, and a cloud of mosquitoes bouncing along behind me. Waiting for any second I spent still while harvesting Morels. But it was well worth it. I've got some ounces or lbs. available as well so feel free to drop us an e-mail if you would like some delicious wild mushrooms in the mail! Join us and the Fraser Valley Permaculture Guild as we spend two days getting our hands dirty while learning the basics of cob, and how to build a traditional earthen, wood fired oven. Covering both technique and theory, you will walk away with the confidence to build your own back yard oven! We will also go over various principles of heat, and fire, including rocket stoves (the twist). Bring your curiosity, questions, excitement and work clothes! I'm feeling sick, and staying in, in our new home, on the eve of a new year. So I'm reaching out in ways that I can to mark the passing of linear time, on the Gregorian calendar. That being said, the new year also could have passed yesterday, or on the Winter Solstice, or on the end of other calendars that chart the solar, lunar, and many other paths of existence. The ever moving line between the new + once new. I'm looking forward to what newness brings at each moment. I'm grateful for what was once new. I am grateful for the line between the two. And for the moments when that line blurs and everything feels new + once new all at once. Things change in those moments. You see the future and the past, and you can feel a shift. You become aware of the change, of the blur. The new for me right now is home. I remember reading once that one of the hardest things anything can do is move..
We spent the past month uprooting, not necessarily deep roots and we didn't move far, but still with that shift there is always an adjustment to be made. Things change and we have to re-familiarize ourselves with our surroundings. At first it can be scary, uncomfortable, and challenging, but there is always going to be what is new, and what was once new. The ability to move between the two is a gift, and is one of the greatest things in life.. the potential for great change.. that something that was once new can become new once again, and that all things move, becoming new + once new with inspiring resolution.